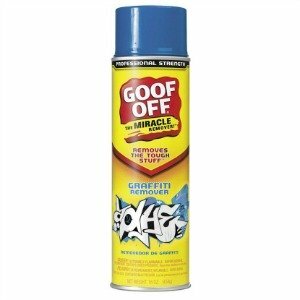 Goof Off Graffiti Remover can be used on many surfaces to clean the tags we all sometimes receive on our personal and real property by graffiti artists. You can see how it worked in this before and after picture, shared by Matthew E. Dotson, on his garage doors. Overall, he was quite pleased with this product. He said, "Works great! It's not quite good as new, but much better than I thought it would work. This door has some texture to it, but on a smooth surface I bet it would get everything off." Do you have any tips for removing graffiiti? If so, or you've used a product to help you with the process I'd love to hear about it. You can share your tip at the link, or read others that have already been submitted.